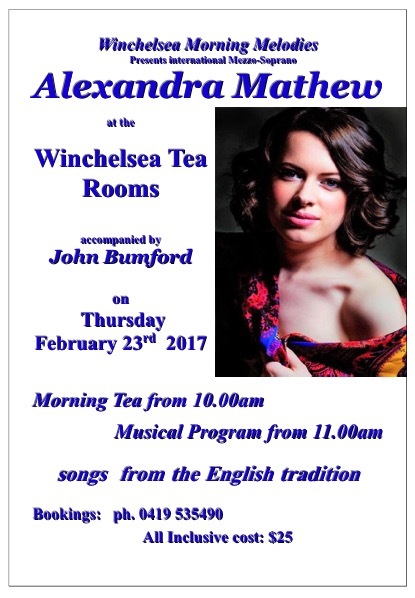 This coming Thursday 23 February I’m performing a morning recital for the good people of Winchelsea, and I can’t wait! The venue is divine—a traditional tea room housed within an old bluestone building—and I can guarantee that morning tea will be delicious (trust me, I’ve experienced it once before! ), complete with finger sandwiches and scones. Yum! Accompanist John Bumford and I will be performing a range of English songs and arias, including Andrew Anderson’s song cycle In Black Ink, and Britten’s arrangement of Purcell’s Evening Hymn (my personal favourite). Tickets, which include morning tea, are $25, and can be pre booked or purchased at the door. See the below flyer for more information. For the past eight months Jenna Roubos (soprano), Georgina Lewis (piano) and I have been busy preparing for our debut recital series at the Barn Gallery at Montsalvat in Eltham. If you’ve never been, Montsalvat is one of the most exquisite spaces in Melbourne, and I’m so thrilled that they’re presenting us as part of their 2017 program. Concert one features Pergolesi’s epic Stabat Mater, in a stunning arrangement with piano rather than orchestral accompaniment. Our intimate winter Lieder recital will warm your hearts and minds, and our final program for the year heralds in the beauty and light of summer with a varied program of English and French art and folk songs. For more information please visit the Montsalvat website or the Trio Lorelei website. Looking forward to seeing you at Montsalvat in May! 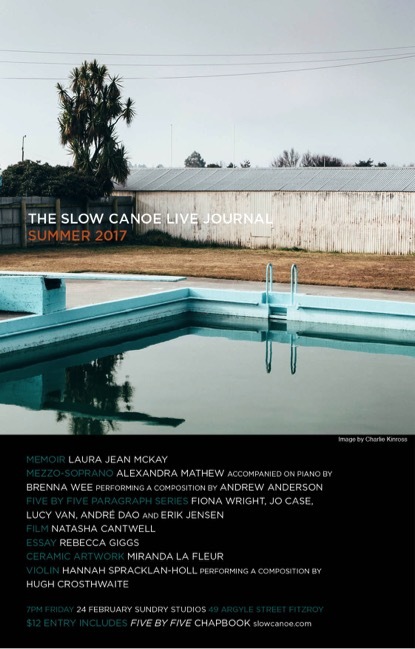 Looking forward to performing Andrew Anderson‘s incredible song cycle In Black Ink as part of the Slow Canoe line-up! See below for details.